As many as 70,000 BC Hydro customers were without power across the Lower Mainland and Vancouver Island on Saturday, after a strong winter storm brought winds up to 90 km/h, knocking down trees around the region. 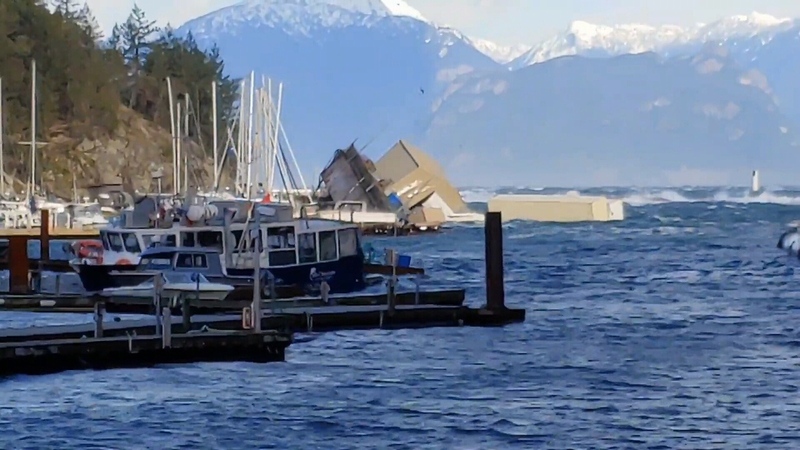 In Horseshoe Bay, heavy seas pushed nearly all of the rental boats at Sewell’s Marina ashore and sank the facility’s breakwater barge. Numerous ferry sailings between Horseshoe Bay and locations around Vancouver Island and the Sunshine Coast were cancelled, including on heavily traveled route between Horseshoe Bay and Nanaimo’s Departure Bay. Departures as late as 2:10 p.m. were cancelled amid wind warnings from Environment Canada. Richmond resident Eldon Arsenault was on his way to Langdale, but got stuck at the ferry terminal in Horseshoe Bay for several hours because of the cancellations. Arsenault said he got out of his vehicle to watch the “chaos” unfolding in the harbour. Roughly a dozen rental boats and two whale watching boats belonging to Sewell's Marina had been dry-docked on the barge. They ended up grounded against the rocks on shore near the ferry terminal. The barge formed part of the breakwater that protected Sewell’s Marina from open water. With it gone, the potential for greater damage to the marina increased, said Rob Frost, a coxswain for the Royal Canadian Marine Search and Rescue station in Horseshoe Bay. He said he has seen high winds in Horseshoe Bay before, but he has never seen them cause the level of destruction that took place on Saturday. In Abbotsford, the wind tore the roofs off of homes and knocked down trees and fences. Mandeep Girn heard a loud noise around 8 a.m. Saturday that scared her and her children. The wind was tearing the tin roof off of their home, depositing it in both their front and back yards. Just blocks away, Sandy McDonald didn’t hear a large tree crash across his fence, but made quick work of the cleanup when he discovered it. 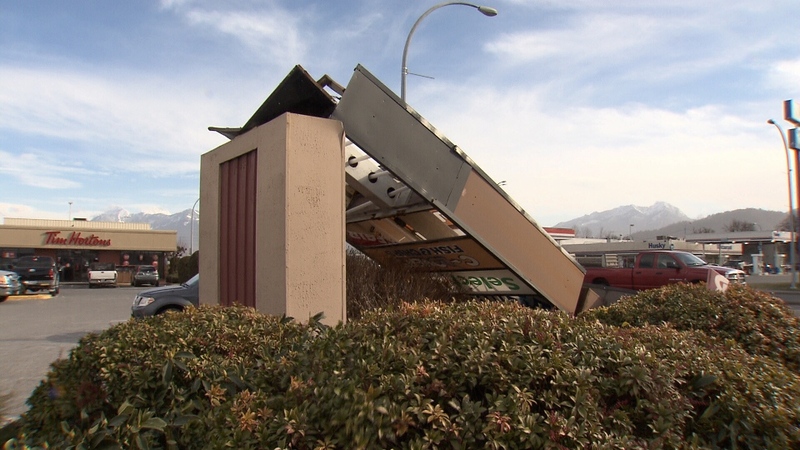 Farther east, some of the strongest winds could be felt in Chilliwack, where gusts were forceful enough to snap off a large sign in a parking lot on Luckakuck Way. Overnight in Maple Ridge, a branch on a power line led to sparking and flames, causing one of dozens of power outages across the region. At its peak, the storm left 70,000 BC Hydro customers in the dark, though the power remained out for fewer than half that many by Saturday afternoon. 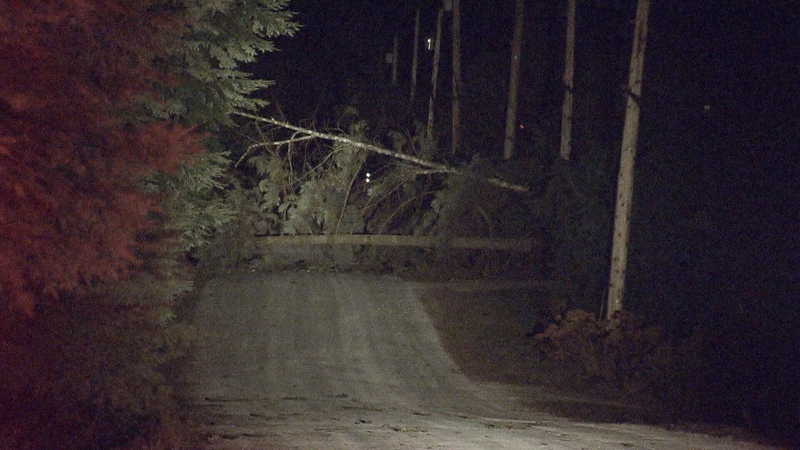 BC Hydro spokesperson Kevin Aquino said the utility company had extra crews on standby in preparation for the storm. “We also had crews strategically positioned in the Lower Mainland, the Gulf Islands, and Vancouver Island as well,” Aquino said. Environment Canada warned that gusts up to 90 km/h would continue through the day over the Fraser Valley, southeastern Metro Vancouver, Greater Victoria and the Southern Gulf Islands. The federal agency warned of the potential for damage to buildings, as well as for loose objects to be tossed by the wind. The agency encouraged drivers to be prepared to adjust their driving with changing road conditions due to high winds. Gusts also grounded gondolas and lifts at ski areas around the region. Grouse Mountain opened at 1 p.m., after winds calmed down, and in Whistler, the Peak to Peak Gondola was closed, along with the 7th Heaven, Glacier, and Symphony express lifts. In Squamish, the Sea to Sky Gondola had to be closed not only because of the high winds, but because there was no power at the base.